Copyright © Wilfred Cude, 2001 | Click here to buy! These letters are published with permission from William Whitehead, literary executor for the late Timothy Findley. To view the original letters, click here. I am writing in full and heartfelt support of Wilfred Cude's application for the temporary position of Assistant Professor in your Department. I must say, at the outset, that ­ quite simply ­ there is no other Canadian academic whose published writings about my own work have been so consistently accurate in their interpretations, so thought-provoking (and occasionally, so revealing to me as author of the works) or so lucidly presented. Whenever I encounter one of Wilfred Cude's analytical pieces, I know I can relax ­ which is not often the case, I must admit, given the number of critical examinations which seem to have missed what I was about while doing the writing. I first met Wilfred Cude when I visited Antigonish during a promotional tour in 1982, and the Dundurn Press profile that resulted from that meeting remains the one article whose reprints I still offer when asked for an overview of my earlier work. Having now met Wilf (and some of his students) on subsequent occasions, I am delighted to be able to back up his application with my most sincere and totally unqualified enthusiasm. He can obviously foster a student's love of the written word; he is one of the most articulate people I know ­ both in person and on the page ­ and ­ having followed the positive reaction to The Ph.D. Trap ­ I know how committed he is to everything that is most effective in academic matters. I am very happy to be able to write about someone who claims so much of my admiration, and would be made even happier ­ in behalf of your Department and your students ­ to know that Wilf's application had been successful. I am writing in the strongest support of the nomination of Wilfred Cude to receive an honorary doctorate from Dalhousie University. I have known Wilfred Cude for twenty years, and during that time, he remains the most consistently accurate, interesting and provocative of all academics who publish interpretations of my writing. I have, over the years, visited his classes ­ and find him just as articulate in person as on the page. Furthermore, I have never encountered anyone who is more dedicated or better equipped to foster both love and understanding of literature among his students. As someone who is totally non-academic (having left secondary education after its first year), I am both aware and admiring of both his books concerning some of the weaknesses of the post-graduate world. 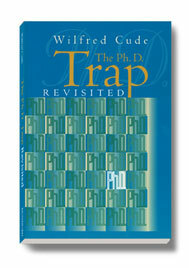 And, given my tremendous enthusiasm for Wilfred Cude's accomplishments in the academic world, I am both puzzled and deeply regretful that he has never received the degree of Ph.D. I therefore urge that the most generous consideration be given to his nomination. For Dalhousie University to confer on Wilfred Cude an honorary Doctor of Letters would be, in my eyes, a signal to the Canadian academic community of how perceptive and generous the Nova Scotia members of that community can be.